During a penetration testing engagement we might come across with the NetBIOS service.In the past the NetBIOS protocol was enabled in almost every network that was running Windows.In nowadays system administrators are disabling this service due to the fact that plenty of information can be unveiled regarding shares,users and domain controllers.However NetBIOS can still be found on default configurations of Windows Server 2008 and Windows Vista so in a penetration testing this protocol can be abused if we discover it. In systems that have this service enabled we can use some tools in order to discover information about the hostnames and domains especially in windows networks.In some cases this protocol can be found and in Linux systems. 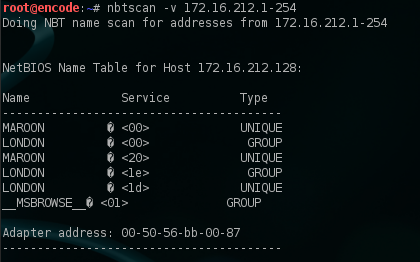 The two basic tools are nbtstat and nbtscan.The nbtstat is a command line utility that is integrated in windows systems and it can unveil information about the netbios names and the remote machine name table or local but only for one host.From the other hand the nbtscan is a netbios nameserver scanner which has the same functions as nbtstat but it operates on a range of addresses instead of one. The numeric values are called suffixes.For example the <01> and <1D> suffixes indicates the Master Browser,the <20> that the machine is running File Server service,the <03> that a messenger service is running and the <00> means that a workstation service is running as well.The <1E> is the Browser Service Elections. The nbtscan is by default installed on backtrack but there is a version as well for windows platforms.We can use the nbtscan in order to scan the whole network.As we can see from the next image we have discovered the IP addresses,the NetBIOS names,the users that are logged in and the MAC addresses from the hosts that are running the NetBIOS service on the network. We can use also the -v option in order to produce a verbose output. With the verbose option the output format is similar to the nbtstat.Again the <01> indicates the Master Browser service,the <00> the workstation,the <20> the File Server service and the <1e> and <1d> the Browser Service Elections and the Master Browser.Also we can see that the domain that this workstation belongs is London. As an alternative option we can use the metasploit module smb_version which will unveil additional information like the operating system name and version,the service pack level,the language,the system and domain name. As we saw in this article from systems that had enabled the netbios service we have managed to discover plenty of information including the domain names,users,operating systems versions,MAC addresses and other.This service if found enabled can be used in the information gathering stage of a penetration test.So from the security point of view it is recommended this service to be disabled.